'It's Lovely Being Mean': Benedict Cumberbatch Gets Into Character As The Grinch Cumberbatch voices the classic Christmas villain in a new movie, out this week. It's a new take on the Grinch, portraying him as an orphaned outcast, traumatized by overflowing holiday emotion. Cumberbatch at the New York premiere of Dr. Seuss' The Grinch. Sometimes it seems like there's no role Benedict Cumberbatch can't play. He's been an iconic British detective, he's been J.R.R. 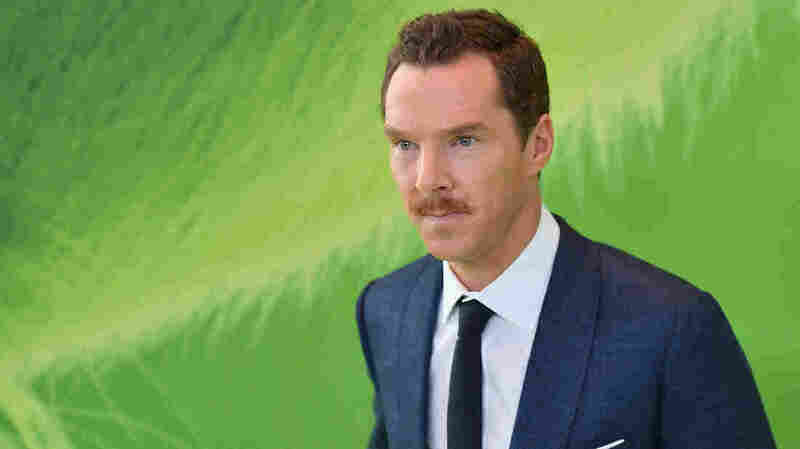 Tolkein's dragon Smaug, he's been Doctor Strange — and now Cumberbatch is back on the big screen, voicing the Grinch, the bright green grump in a new animated version of Dr. Seuss's famous Christmas tale. Cumberbatch says the story is a classic, but it was due for a reimagining. "I think it's such an iconic American role, and something I was surprised to be asked to do, and that's a good thing in an actor's life, when you're surprised by an offer." He's part of Whoville, even though he's separated from it, and that's very much the heart of our retelling — this guy is traumatized by Christmas, because poor thing, he grew up as an orphan, and therefore all the joy and belonging and loving he sees going on everywhere else, he's not a part of. So he's, you could say, green with envy, and it makes him far more empathizable and far more of a sort of antihero, and also, we kind of enjoy the Grinch, we like him, we're used to him being mean. But he's only really scary when he can't see any answer other than stealing Christmas, and then he does get a bit psychotic — not to put our younger viewers off, but he becomes a bit tunnel-visioned, and the world we live in today, we know a few people like that, I think, who act out on hate and ignorance and fear, and it's pretty toxic. And the lesson, I think, is that you can take those people back into the fold by offering love and forgiveness. It's hard to imagine children that wouldn't be upset by the idea of waking up and discovering that all of their Christmas decorations and presents ... it is also a learning curve for the Whos in our version. I think in the book it's sort of slightly glided over that they're just, they're high on the spirit of Christmas, but I think the film deals with the reality, especially in the modern context, that those things are part of the excitement of Christmas, but they shouldn't be the raison d'etre for the excitement. The real excitement is the people who are giving each other something, the joy and love and generosity, the things we need most, as the Grinch says at the end of the film. I wouldn't, myself, go about knocking the heads off snowmen ... But I quite like playing those things, because watching them, you get a vicarious thrill out of it. I had a lot of fun doing that. It's lovely being mean. It's great fun. I wouldn't, myself, go about knocking the heads off snowmen, or taking a jar away from a woman who's trying to reach to the top shelf to get it, and then put it back out of her reach. But I quite like playing those things, because watching them, you get a vicarious thrill out of it. As far as getting into character goes, it really was the book I went off first, and then we realized, oh Christ, he's just really mean. He's very kind of growly and snarly — that would take some enduring for an entire film, it would be a bit scary for kids. So we decided to remind ourselves that he really, really enjoys Christmas. You know, what we do for a living, there's a lot of navel-gazing, it gets a little bit serious in some interviews talking about all this, but the fact is, it's play. All of this is play. We're narrators, we're storytellers, and you reduce back to that innocent state of imagining and imagination, which is what all of Seuss's worlds are from. They're so extrapolated from our reality, they're so odd and unreal, and yet universally catchy and poignant and pertinent, and they transcend cultures and logic, because they just tap into that need for story and theme, and through rhyme and amazing illustrations, they do all that. So if you're an actor free on a mic to kind of imagine all that, it's kind of, it's a wonderful state to be in. This story was produced for radio by Ian Stewart and adapted for the Web by Petra Mayer.